Miners have always been a close-knit and some would say clique group, some would say the 'aristocracy' of the working class. There is no doubt the nature of their work made them a 'breed apart' from their peers. 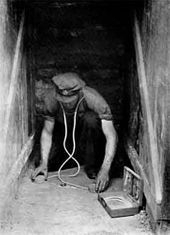 I have touched on the reluctance to recruit miners as tunnellers but by 1916 a major drive was made to recruit men from the pits. This coincided with a massive demand for coal from the Royal Navy and the Industrial war machine of Britain, not to mention it's citizens who relied on coal to heat their houses and in many cases cook their food. Miners responded in overwhelming numbers to the rallying call, many pits were left very short handed, old men and boys filled the places of men who had gone to the front. They simply could not keep up with the demand for coal. Some form of control was demanded by the mine owners, and in response a series of Colliery Recruiting Courts were set up, in the case of the Lothians, at Tyne Lodge in Grange Loan, Edinburgh where every man wanting to serve King and Country had to appear at before being granted permission to enlist. One of these men was my Great Uncle William Duncan, in many ways typical of the type of man in Tunnelling Companies, an experienced miner from many generations of miners, single and in his late twenties, short and wiry at under 5'4" and only 9 stones, he had known no other life than that of a miner, and had been down the pit since he was 14. He attested in December, 1915 under the Derby Scheme but due to his occupation was left in situ. 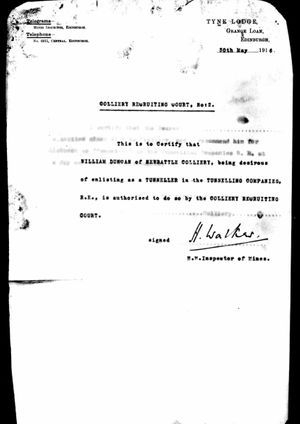 In June 1916 he approached the manager of the Lady Victoria pit in Newtongrange, the infamous Mungo Mackay, to obtain his permission to enlist via the colliery court. 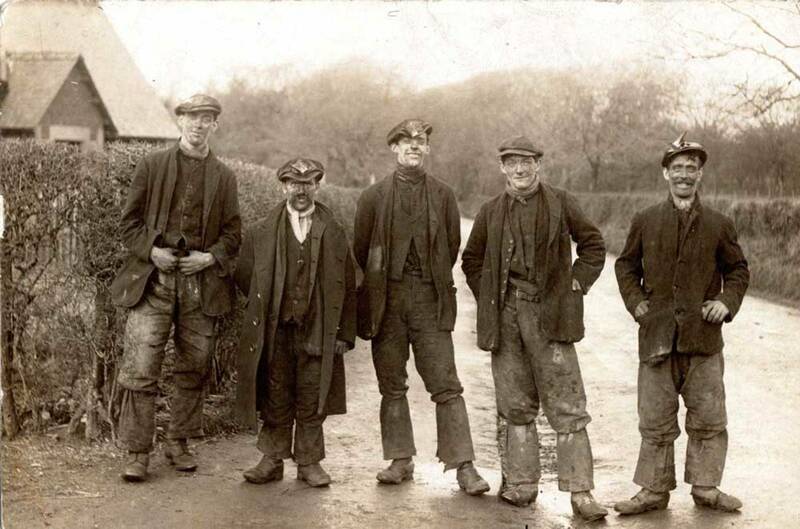 Although the pit was short handed, Mr Mackay agreed immediately and signed a letter approving his application and endorsing his skills as a miner for the 6 bob a day wages. 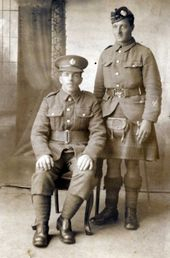 Mungo Mackay's son was a serving officer with the Machine Gun Corps, and for all his faults, including draconian discipline, Mackay respected any man that went to serve his country, their wife and children would live rent free in their Lothian Coal Company house and they would receive a half allocation of coal for the duration of the war. 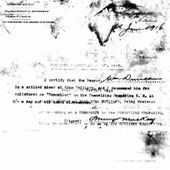 Armed with letter of endorsement (pictured) William Duncan attended at the Colliery Court where his acceptance was now a formality. He received no formal military training beyond basic drill instructions, and was effectively a civilian under military control. This did cause problems, not for William, but for a group of Fife miners, notoriously the most 'Red' of workers. On arrival at the front a number of them discovered that they had been designated Tunnellers mates at 2/ 6d rather than Tunnellers at 6/ a day. To them this was an insult and an injustice, which they addressed in typical miners fashion. A senior man was appointed to speak to 'management' and in the meantime they downed tools, in effectively a strike. Despite being threatened with a Court Martial by a Sergeant, the consequences of which they didn't seem to grasp, they stuck to their guns for their money. Perhaps fortunately, one of the Company officers understood the way of the miners, and rather than have them all Court Martialled for mutiny, punishable by death, he opted to have all the men paid 6/ and gave them a stern lecture regarding their future conduct. There were a few pale faces when they learned they could have been shot.